It’s hard to believe REDCON1 have only launched the brand late 2016. Since then we have covered several of their products with notable mentions to the Total War Pre-Workout making our top 10 best Pre-Workout, Big Noise – our best non stim Pre-Workout and Mental Trigger our Best Nootropics. Yeah, that’s a lot. MRE is taking after Rich Piana’s Real Food MRP product line, bringing in a full meal replacement solution made of WHOLE FOOD sources. 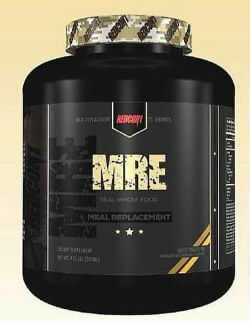 This is not your typical Mass Gainer, MRP product, we are talking a real meal in powder form! Check out the ingredient list below. When was the last time you saw Beef, chicken and Salmon on the label of a fitness supplement? Well, as we said, whole food sources! Let’s start from the top: 525 calories / serving (4 scoops). 47g Protein, 75g Carbs (only 5 sugar), 4g Fat. Pea Starch Taurine is a performance enhancer, boosting strength and muscle recovery. Though it failed to do so in a couple of studies, we still think it does its job pretty well. 2g is double the amount you might see in the average pre-workouts using this ingredient, so you would think Tim Muriello takes this one seriously. Other Coconut Water Powder, Dehydrated Blueberry, Dehydrated Goji, Maltodextrin, Dextrose, MCT Oil, Natural Flavor, Cellulose Gum, Cinnamon, Salt, Sucralose, Ace-K. A good mix of super fruits for anti oxidation, vitamins and minerals. Best Flavors & Mixability – MRE Launches in 2 flavors: Blueberry Cobbler and Sweet Potato Pie. And we will update this post as soon as we get a chance to try them! 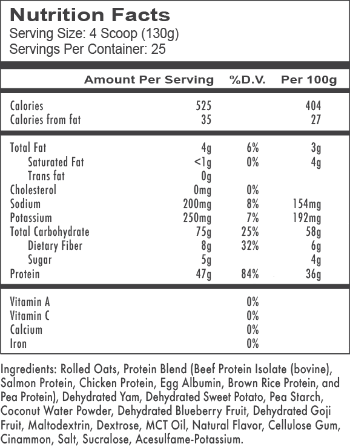 At 25 servings per tub, MRE launch price is $71.99. That’s $2.5 per meal. $71.99 sounds like a lot of money, BUT, we challenge you to find a meal with the above macros and ingredients that will cost you $2.5! Just like when comparing the cost of 50g of Whey Protein to chicken breast, beyond convenience you will be saving tons of money here. Obviously, you can compare prices for REDCON1 MRE on Fitness Deal News, and make sure you sign up to the deal alerts to be the first to know when we hunt down a deal on this exciting product. We love what we are seeing here! Though personally I still rather eat my food rather than drink it, when necessity comes in or when looking to diet on a budget or on the go, REDCON1 MRE is the best product I can think to solve the problem! NOT SURE WHICH WEIGHT GAINER IS RIGHT FOR YOU? CHECK OUT OUR BEST 10 WEIGHT GAINERS FOR 2017.